I am moving this weekend. Lots of packing....not enough boxes. As part of my procrastination efforts, I finally finished my sushi pjs...yes, the pajamas I started months ago. The knit fabric is what slowed me down! A few weeks ago Dan and I went to see the great blue heron nests at Stow Lake, and we learned of an oriole nest on the stone bridge...it was a beautiful woven nest on a small palm tree. This weekend we went back to see how the young herons were doing, and actually saw an oriole...probably papa bird...very striking yellow and especially beautiful in flight, when the black and white wings are in motion. 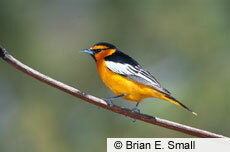 Not sure if it was a Bullock's Oriole or Hooded Oriole.